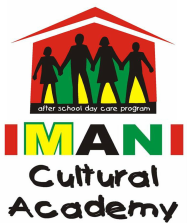 ​IMANI Cultural Academy, Inc. is a registered 501(c)3 not-for-profit organization that depends on support from generous individuals and groups in order to strengthen our services. Donations of food or supplies are always welcome. Please contact us in advance if you would like to donate food or supplies. We also accept monetary donations; checks may be made payable to: IMANI Cultural Academy, Inc. If you have any questions about making a donation, do not hesitate to contact us.